Are there any green PACs working to influence elections? 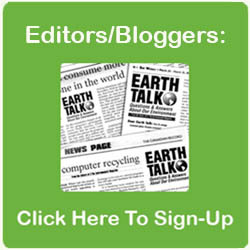 Dear EarthTalk: Are there any green PACs working to influence elections? As a matter of fact, green Political Action Committees (PACs) emerged as major funders last fall in the run-up to the 2014 Congressional elections, and look to play an even larger role in next year’s Presidential and other races. According to the Center for Responsive Politics (CRP), PACs are political committees, typically representing specific business, labor or ideological interests, organized for the purpose of raising and spending money to elect and defeat candidates. They must register with the Federal Election Commission and are limited to donations of $5,000 to any given candidate per election—but can also contribute $5,000 annually to any other PAC and up to $15,000 annually to any national political party. PACs can receive as much as $5,000 from any one individual, PAC or political party per calendar year. Meanwhile, so-called Super PACs aren’t beholden to fundraising or spending limits, but can’t make contributions directly to candidates or political parties like regular PACs. “They do, however make independent expenditures in federal races—running ads or sending mail or communicating in other ways with messages that specifically advocate the election or defeat of a specific candidate,” reports CRP, which produces the OpenSecrets.org website scrutinizing what PACs are spending and on what. Hedge fund billionaire Tom Steyer is pouring tens of millions of dollars of his own money into influencing voters to use the democratic process to oust public officials blind to the real causes and effects of climate change. The biggest among the new breed of green PACs is billionaire hedge-fund manager Tom Steyer’s NextGen Climate Action super PAC, which poured some $50 million toward battling climate “deniers” in races across seven key states in 2014. NextGen has already committed upwards of $5 million into the 2016 election cycle, with much more likely to come over the next several months in an effort to “disqualify” presidential candidates who deny that climate change is real or caused by human activity. Another big player is the League of Conservation Voters’ super PAC, which pledged $25 million alongside NextGen in 2014. The next two biggest green super PACs to date are the Sierra Club’s Independent Action and the Environment America Action Fund, both which spent roughly $1 million to influence 2014 elections. The Defenders of Wildlife Action Committee spent $350,000 on 2014 elections. As for regular PACs, those already amassing their funding war chests for 2016 include the League of Conservation Voters, the Center for Coastal Conservation, Ocean Champions, Environment America, The NRDC (Natural Resources Defense Council) Action Fund, Defenders of Wildlife Action Fund, Environmental Defense Action Fund, and the Sierra Club. Other green PACs are expected to join the fray. While not a PAC per se, Crowdpac gives everyday people the ability to research candidates based on their own values and priorities and provides an easy online mechanism for making direct campaign donations. The website’s founders view Crowdpac as a tool for democratizing the U.S. election and campaign finance processes. Maybe you don’t have to be a billionaire to influence politics in America?